Its typical to experience 45°C during the summer season in UAE. Most people know the basic principles in keeping cool; stay out of the sun during the hottest part of the day, drink plenty of water, use sunscreen when you're outside. Though there are some tips and tricks that are often vague and unclear. Let's give clarity to some of these tips. 1. Cotton is the only fabric that keeps me cool. Most people would think that wearing a white cotton top and shorts is the best choice this summer. Though practically correct, there are still a lot of other options to wear this summer. Keep in mind that natural fabrics are the best pick, they absorb sweat well and allow clothes to breath. Most synthetic or man-made fibers like polyester trap moisture against your skin, which leaves you hot and uncomfortable. 2. The color of my clothes affect the heat temperature that I experience. White is good if you're out in direct sunlight a lot - it will reflect the heat better than any other color. But if you're spending time in the shade, black is a more effective color to wear as it radiates out heat into your environment, cooling you down. 3. Drinking hot drinks actually lowers your body temperature. Staying hydrated is key. If you don't drink lots of water and beverages like fruit juice, you can start to become unwell, with symptoms of headache and tiredness. 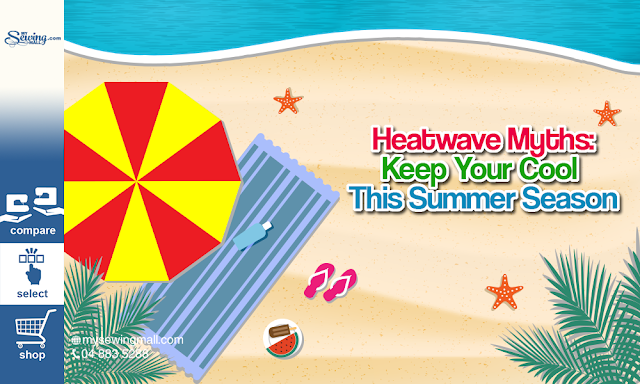 It can lead to heat exhaustion and heatstroke, which in the worst cases can be fatal. What about hot drinks? Can they help cool you down? The thinking is, drinking a hot drink raises your body temperature, causing you to sweat. Sweating cools you down because as the moisture evaporates it takes away some of the heat of your body. But sweating also means that you are losing liquid from your body, meaning you need to take on more to stay hydrated. 4. Keeping curtains closed, block out the sun. Keep in mind that like clothing, you need pick curtains that have breathable fabrics. If you have thick dark curtains, it's better to keep them open, otherwise the fabric can keep the heat trapped inside the room. Lighter curtains can help reflect the sun's rays back out of the room, so keep them closed. Putting something reflective on the outside of the glass can bounce the heat away, keeping the room cool - like the screens that go on the windshield of your car. 5. Should I keep the windows open? This is another question that has no hard and concrete rule. You should always consider your home security and safety when leaving windows and doors open. The thinking is if you are in a cooler room than the temperature outside then keep the windows closed, otherwise all you are doing is letting hot air in. But if the room is warmer - and this is much more likely to be the case at night - then opening the windows will help cool your home down.